Fast drying oil that is applied in one drop over freshly manicured nails and thoroughly dries all layers within minutes to help prevent smudges and dents. 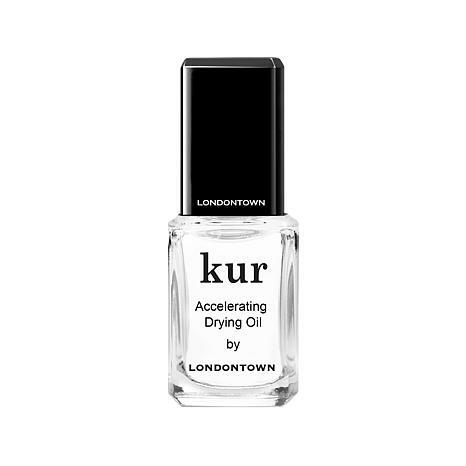 Following kur Top Coat application (sold separately), wait two minutes and apply kur Accelerating Drying Oil to each nail. For faster application, use enclosed dropper. Tilt nails down and apply one drop at base of nail. I have been ordering the smudge fix for several years now and cannot be without it. Decided to give this dry oil a try and wow, does it work! I let my nails dry for a few minutes and add a coat of this with the brush and it really does as it's suppose to...quick dry. Gonna have to try everything from this line of nail products! The smudge fix is also a must have just in case you mess up your manicure, another quick fix that works.